TENWEST Discover Local @ TMA is the kick-off event for this year’s TENWEST Festival and aims to connect community members to localism through unique and exciting micro-workshops focused on art, technology, sustainability, and more! This family-friendly event in partnership with Tucson Museum of Art's Second SundAZe – Family Day offers admission to the museum for residents of Arizona and Sonora, Mexico. Visit the new exhibit, 30 Americans, and join in on a Kehinde Wiley inspired selfie station, art-making projects, and a performance by Liudvik Luis Cutiño Cruz at 1pm. 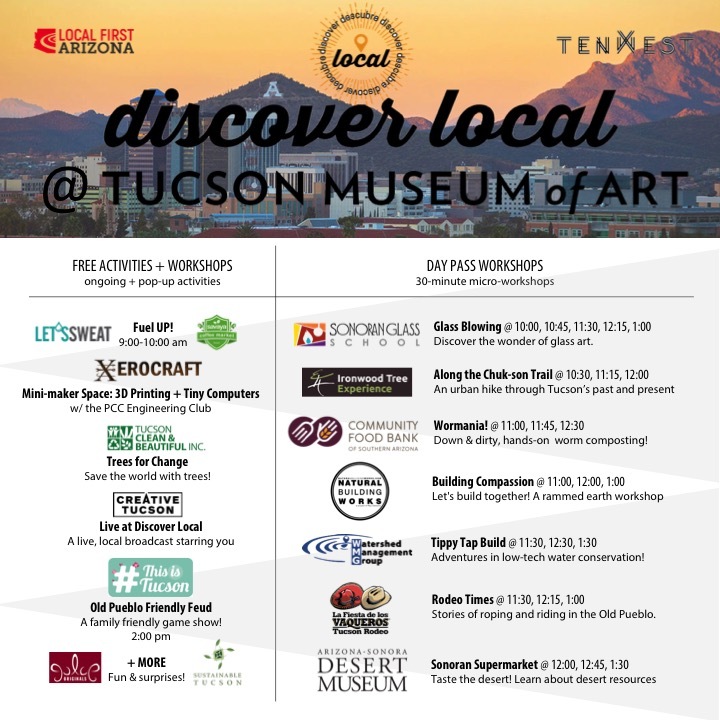 But wait, there’s even more… TENWEST Discover Local @ TMA offers Tucsonans hands-on ways to experience what it means to live local and take everyday actions to positively impact our community. The TENWEST Discover Local Day Pass ($10) is available onsite during the day of the event. The pass is required for admission into some of the micro-workshops and will unlock special activities and prize opportunities, including admission into all activities and local prize opportunities such as a Bisbee getaway and more! As a bonus, the day pass provides admission into FUSE at La Cocina from 4:00 pm – 9:00 pm. Want even more throughout the week? Get a TENWEST passport! TENWEST is made possible with support from presenting sponsors ACA and the University of Arizona. Passes on sale now at www.tenwest.com! $25 for general admission, $10 for military and students. The festival runs from October 12–21 and includes the day pass for Discover Local. Living Green/Viviendo Verde: There are simple things we can do to promote a healthier planet. Through hands-on demonstrations, this track introduces participants to sustainable living at home. From effective recycling, to energy efficiency and DIY rainwater harvesting, we can all do our part at home to support our local and global environment. In Your Backyard/En Mi Jardin: The Sonoran desert ecosystem is a complex and beautiful place that doesn’t end at the border of Tucson Mountain Park—it’s in your neighborhood, too. This track will give participants interactive ways to discover the urban ecosystem in their own backyard and learn how our local community is uniquely interconnected. Art and Technology For All/Arte y Tecnología Para Todos: Makers and micro-entrepreneurs are the backbone of local economies. This track will give participants a hands-on introduction to DIY resources for innovation in Tucson. From unique crafting to gadgets, participants can try their hand at local innovation. Viva Juntos: The heart of a community is its people. This track celebrates all the things that bring us together. Participants will have the opportunity to work alongside each other on public art, music, games and more, while celebrating our local community. Expect many surprises throughout the day! PLUS: TENWEST FUSE Concert 4:00 PM - 9:00 PM at La Cocina including Local Dance Off For Nonprofits! Fuse brings together dance, comedy, and music into one incredible night. The evening kicks off with a dance-off between local crews, each representing their favorite charity. The winning crew earns bragging rights and a donation to support their cause. After a comedy set by the Comedy Alliance of Tucson, we have an incredible lineup of local talent—Adam Townsend, Seanloui, and Juju Fontaine. Follow @discoverlocaltucson on Instagram & like us on Facebook for updates and more! The Presidio Museum across the street also has fun activities going on from 11:00 am - 4:00 pm. Check out the extra events for the fun filled day! Come to the Presidio Museum to see how the cochineal dye is made and paint your own bookmark with it. You may be surprised find out how many products still use this “organic” dye today! Presidio-era games will also be available for children to try. Follow the signs from the Museum of Art to find the Presidio Museum at one block away at 196 N. Court Ave. This activity is included in Presidio Museum admission of $5/adult, and $1/child ages 6-14. Children under 5 and Presidio Museum members are free along with TENWEST passport and day pass holders. Partners on this event include LeadLocal, Vib’n, Mrs. Green’s World, Southern Arizona Urgent Care, AGM Container Controls Inc., Hydrant, Fox Restaurant Concepts, La Cocina, Xerocraft, Tucson Clean and Beautiful, Creative Tucson, BRINKmedia, This Is Tucson, Julie Originals, Sustainable Tucson, LET'S SWEAT, Savaya Coffee Market, Sonoran Glass School, Ironwood Tree Experience, Community Food Bank of Southern Arizona, Natural Building Works, Watershed Management Group, Tucson Rodeo - La Fiesta de los Vaqueros, Arizona-Sonora Desert Museum, Tucson Fringe Festival, Life Along The Streetcar, and more to be announced. TENWEST Festival is made possible by the support of presenting sponsors Arizona Commerce Authority and the University of Arizona. The ACA works to advance and strengthen Arizona’s economy by recruiting out-of-state companies, helping existing companies and entrepreneurs to grow their businesses, and create new jobs. The University of Arizona is committed to being a catalyst for southern Arizona's innovation economy in educating the next generation of leaders, entrepreneurs, and STEM experts. Thank you to our sponsors: the University of Arizona, Arizona Commerce Authority, Southern Arizona Urgent Care, AGM Container Controls Inc., the Tucson Museum of Art and Historic Block, La Cocina, Hydrant, Crown Chimp, and TENWEST Festival.